Kasuri Methi Chicken curry recipe with step by step instructions.తెలుగు వెర్షన్. 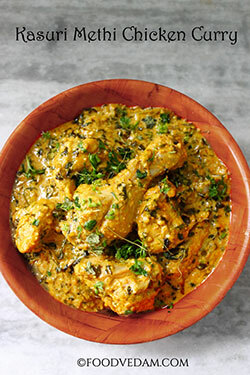 Kasuri methi chicken curry is a tasty restaurant style rich gravy recipe.I used to have a misconception that any recipe cooked with fenugreek leaves will taste bitter until I tasted Kasuri Machchi curry ( fish curry cooked with dried fenugreek leaves) at one restaurant.I took it into my plate with little hesitation.but the moment I ate it I really loved it.from that day I have started using Kasuri methi/dried fenugreek leaves or fresh methi/fenugreek leaves in my cooking. rinse chicken thoroughly and take into a bowl. add turmeric powder, salt, red chili powder, coriander powder, pepper powder, bay leaves, nutmeg, mace, cloves, cinnamon, cardamom, ginger garlic paste, yogurt and mix well. soak the marinade for 30 minutes. Meanwhile, you can make other preparations. soak 6 cashew nuts in water for 20 minutes and make them into a paste adding some water. I have followed the instructions given on the packet. boil some water and turn off the heat. add salt, Kasuri methi and soak for 2-3 minutes. Strain out the water from Kasuri methi and keep aside. heat a pan, add oil and butter and wait until the butter melts. add chopped onions and green chilies, salt and sauté until they become soft. add ginger garlic paste and sauté until the raw flavor disappears. then add a pinch of turmeric powder, red chili powder and give it a mix. put the chicken marinade and mix well. cover it and cook on medium heat for 20 minutes.mix in between. After 20 minutes, add cashew nut paste, soaked Kasuri methi, cream and mix well. add one cup of water and bring to a boil. When the curry starts to boil turn it to simmer and cook until the gravy thickens. add chopped coriander leaves and turn off the heat. your recipe looks amazing! my only question is whether to include the pepper powder or not. Your video shows you adding white pepper powder 1/2 tsp to the marinade, but your instructions do not include that quantity. which is correct? Thanks! Is there a good substitute for cream. I’m not a big fan because of the calories. Hi, Annie.You can just skip that if you don’t like…or you can add low-fat yogurt. Pinterest save buttons are already available on each page(left&bottom) and on each image.plz come back and check once.if you still can’t see then there might be some problem with your browser.let me know if you still have the same problem.try with another device like pc or tab or mobile.